Moving with children is never easy. The act of moving by itself is no walk in the park, with finding a home, planning the relocation, packing all the items, making sure finances are cleared, ensuring friends and family are aware, and so forth—adding children to the mixture can make moving appear impossible. But with the right planning and the right interactions, you can make moving with your beloved children a thousand times easier. The following is a guide on how to move with children of all ages. Although it seems odd to suggest moving to your child, it will actually make the act of informing them of the upcoming move much easier if you’ve already planted the idea in their brain. Doing this will also make the child feel as though they are part of the decision to move, which is crucial. As soon as you know there is a move in the future but don’t yet have the exact details, begin talking to your children about the concept of moving. Be sure to emphasize all the wonderful aspects of moving: getting a new and better room, painting their room a certain color, a bigger yard, a neighborhood with more children or playgrounds and sports fields, a nicer school, etc. For example, if you have multiple children, maybe the benefit is that each child gets their own room; if you live in the city or an apartment and don’t currently have a yard, maybe the benefit is that you will have a yard with the next home; if you live in a school district that doesn’t offer recess time, maybe the benefit is that the new school district mandates recess; etc. For high school-age children, some benefits could be: a larger selection of electives, the opportunity to join a sports team, a school closer to home and therefore a shorter bus ride, etc. With suggesting moving, the primary goals are to get your child to A) express what they would want out of a move and B) express excitement for the prospect of a potential move. By knowing what they want from a move in advance, you can then coordinate the upcoming move such that their wants/needs are met as closely as possible, further making the move easier. With older children, keep in mind that one of the hardest parts of a move is staying in touch with friends. Today’s technology makes staying in touch much easier than before, but it’s always good to bring up the various possibilities, from Skyping and texting friends to using social media. When possible, the ability to visit old friends is always a great item to bring up. Once the move is certain, break the news to your child with a family meeting. Be sure to draw from earlier conversations and emphasize all the wonderful new parts of the move. If your move is a military relocation, then depending on the age of your child, they may be concerned that this isn’t a move but actually a deployment. In this event, clarify the difference between a move and a deployment and be sure to reassure them that you are staying. Assigning them a specific task to do on moving day, such as packing a special bag to take with them in the car, on the plane, on the train, etc. This will help keep them preoccupied while you’re packing and moving furniture. Children often have favorite toys that they’re particularly concerned about losing or prefer not to be without, so having them pack a special bag will help give them peace of mind and ensure those toys are safe during the move. If traveling by car, include some of your child’s favorite snacks to help make the move an adventure. If you’re driving across the country, take it a step further and plan out a few stops at interesting places (museums, monuments, etc.) and rest stops where your child can get out and run around, such as playgrounds. Giving your child the chance to stretch their legs will help decrease the likelihood of an outburst from being cooped up in a car, and help tire them out so they’re more likely to nap through the drive. Determining what their future room should look like by drawing it. Not everything can be incorporated, but this will tell you more about what your child is hoping to get out of the move, how to help them achieve it, and provide your child with a sense of control in the move. Have your child create a pre-moving-day checklist of which items are especially important to pack, which should stay with them during the move, and so forth. Have your child maintain a moving journal, such as the one we provide below, and document their journey from their old home to their new home. This journal will give them another outlet through which to express their emotions. The child who has a lot of dolls, stuffed animals, action figures, or army men may not want to pack their toys for fear of the toy being frightened or injured. In this event, tell them that their toys need to go to sleep by being packed away during the move, otherwise they will be frightened and they may injure themselves in their fear. Once you’ve reached the new house, you can wake the toys up together by unpacking them; the toys will then be excited about being in a new home. This tactic works best on children under ten years old. Even very young children are capable of voicing their fears and concerns in some way. Be sure to listen to these concerns and answer any questions they have: acknowledging their worries will go a long way to alleviating them. As is the case with adults, children just want to be heard. As challenging as this may seem during something so uncommon as moving, it’s important to maintain as much of your child’s typical routine as possible throughout the move and to reestablish it once in the new home. For example, if you have a ritual for going to sleep, maintain it even when the house has been mostly boxed up. If you eat a particular type of food on a certain day of the week, be sure to keep doing that as well. These routines will help ground your child and make the move appear less foreign and frightening, and more natural and exciting. Moving is just as stressful for your child as it is for you. As such, be prepared for your child to regress temporarily, especially if they’ve only recently been potty-trained. Regression may even occur after you’ve moved and as your child is adjusting to the new environment. Home may be where the heart is, but it doesn’t always feel like that right away. It takes some work to make a house feel like a home. Even though there will be a lot of unpacking to do, take it slowly and unpack the items that make you and your children feel most comfortable and at home first. These small touches, such as favorite family photos and throw blankets, will help bring the house to life. In addition, a great way to welcome your children to their new home is to have a housewarming present waiting for them in their room, bathroom, or closet. If it’s a toy, you can encourage your child to show the toy their new home and go on a tour through the house – this will also help ease the transition for your child and give them an outlet to deal with any nervousness from the move. Remember, children pick up very easily on emotional cues from their parents. If you’re nervous or agitated about the move, then your children will be similarly nervous and agitated. But if you’re excited about the move, then your children are much more likely to enjoy the move or at least handle it well. To help make moving an exciting adventure, we’ve made this special Howard Hanna Children’s Moving Coloring Book as a free download for you! 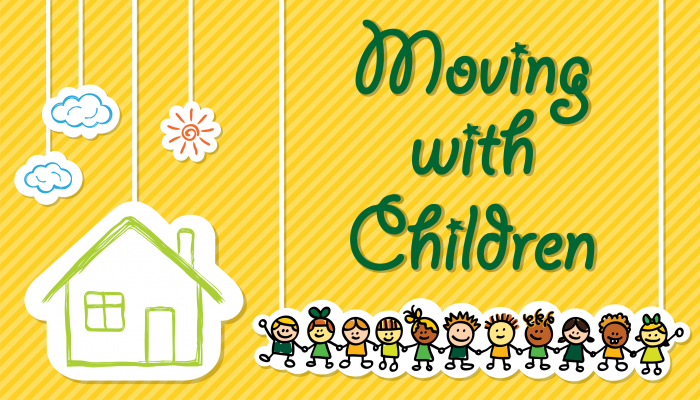 It’s another great way to keep your children engaged throughout the move.